It's crucial to provide charter guests with plenty of options that will suit everybody on board. While some guests may want to soak up the rays while remaining close enough to the water's edge for a quick dip to cool off, others may hope for an action-packed day of water toy fun. But how can owners go about pleasing everyone? The answer might be simpler than you think. To add versatility and space to a superyacht's deck areas, the most elegant solution has to be a set of inflatable platforms from British brand NautiBuoy. 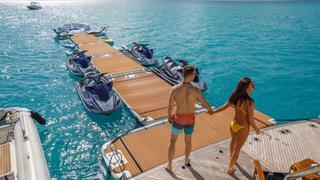 The modular system attaches to the aft of a superyacht, extending as a beach club that can be adapted for a myriad of uses, from a luxurious lounge spot to Jet Ski docking stations, or even walkways. Each platform can be inflated or deflated in less than five minutes and when not in use, the platforms can be rolled up for easy storage. "On board we have had four NautiBuoy Platforms and other accessories for over three years now and they are brilliant," said the owner of 54 metre superyacht Mischief. "We use them for everything — swimming, sunbathing, launching the water toys and cleaning the sides of the boat." These platforms won a DAME Design Award in the deck equipment category three years ago and continue to impress owners, captains and charterers alike. "The safety they provide when docking the tenders and unloading passengers, has proven invaluable," adds the owner of Mischief. "The NautiBuoy platforms act as an extension of our yacht that we use everyday, they are a must-have item for any boat big or small. You won’t find better." They are available in four different sizes, the largest of which only weighs 42kg, so can be transported by two members of crew. Additionally, each platform features four built-in 40 litre ballast bags, making them exceedingly stable. The possibilities are endless in terms of arrangement, as the platforms connect together via Air Toggle technology (an entrapment free connection which means no hard or mechanical parts are needed). A range of accessories is also available to complement the NautiBuoy platform set up. The C-Dock is the perfect add-on for those with a need for speed. This simple Seabob docking system allows for easy mooring for Seabobs during days spent out on the water. Alternatively, those keen to relax will benefit from lounger-style seats and headrests — for a quick dip into the water, guests can use uncomplicated pool-style ladders. 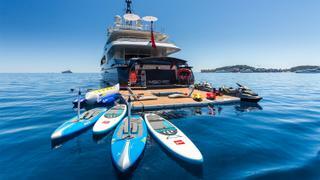 The owner of 50 metre Ocean Club said: "NautiBuoys are truly amazing! I have been able to create an additional 80-foot beach club/marina, which is very exciting." Create more options for your guests on board and order yours from nautibuoymarine.com, or get in touch with the design team to create a customised modular platform system to suit your superyacht.